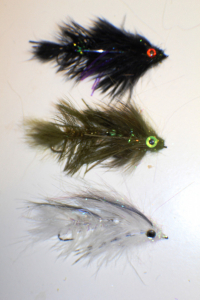 Some new streamers to taunt Muskegon river Smallmouth bass ! The Muskegon river fishing report for July 11, 2018 in the Newaygo, Michigan area is about LOW WATER !!! Due to the lack of rain and “who knows what’s going on with Consumer Energy’s operation of Croton dam”, the river is at a low level I have not seen sustained during summer months, in over 20 years. Low, clear water + fish that have been gorging on all kinds of bait fish and crayfish = tough fishing in certain stretches of the Muskegon river. As odd as it sounds, the “readings” for water temperatures as seen on the USGS site for Muskegon river water conditions, is shown as warmer than what I got taking it in person yesterday. This may be due to the location of the instruments that take such data, but the online graph shows 76-77, I got 70-71 down by Henning County Park in Newaygo. All this being said, we are still getting into some Smallmouth bass, Rock bass and the occasional Rainbow or Brown trout with both fly fishing and light spin tackle equipment. Click HERE to read an article on summer fishing in the Muskegon river. With a forecast calling for some rain within a week, we could see overall conditions improve with a slight rise in water levels.